Before giving your dog even the best multivitamin for dogs, it’s a good idea to check with a holistic vet to determine deficiencies that currently exist in their diet. 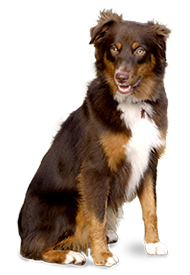 Most dogs will receive the nutrients they need from a well-balanced raw food diet. However, it’s not always easy to know if the diet is covering all of their needs. 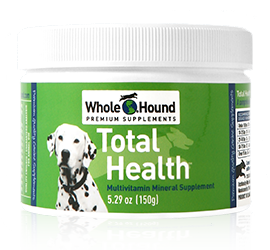 If there is any reason why your dog may be suffering from a deficiency of particular vitamins, you may want to consider Whole Hound Total Health Plus, one of the best dog multivitamins you can add to your dog’s food. Even if you are cooking nutritious meals, you may be told by your vet that your dog is deficient of certain nutrients. You may believe you are cooking perfect meals but deficiencies can still occur as a result of food being stored at a temperature that is too hot or too cold. If you think that your dog may be suffering from malnutrition, look at where you are storing his or her dog food in addition to adding nutritional supplements. Besides a deficiency, you may wish to give your dog a supplement if he or she suffers from a particular disease that will respond to a vitamin or mineral. For example, dogs that suffer from Dermatitis, may respond well to zinc. When providing your dog with supplements, make sure that you only use supplements intended and formulated specifically for dogs. 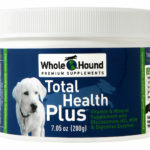 Commercially processed multivitamins for dogs can potentially be harmful. If your dog is already consuming a well-balanced meal, a commercial supplement may lead to your dog receiving excessive or inappropriate quantities of a particular vitamin. For instance, if your dog receives too much calcium, this can lead to bone deformities. Dogs who receive too much vitamin D might stop eating. Excessive amounts of vitamin A can lead to circulation problems and dehydration. Incorporating natural dog vitamins in the proper dosage is the safest way to making sure your best friend maintains good health. Speaking with a holistic vet can ease your mind and help you plan an appropriate diet. It can be difficult to determine the cause of your dog’s symptoms. 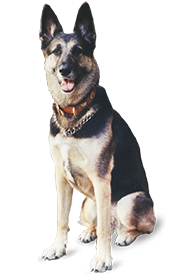 You may believe that your dog is suffering from arthritis, but the symptoms are being caused by neurological problems. A true dog health professional is best for identifying the real cause of the symptoms and which dog vitamins will alleviate them. I really like your tip to talk to a vet before you start giving your dog supplements. It could be dangerous for your pup, and a waste of your money, if you are giving them supplements they don’t need. I like that a vet can make sure you are treating the correct cause and help you to keep your dog as healthy as possible. Thanks for these tips!